^ Harry Potter and the Philosopher's Stone. British Board of Film Classification. [2014-12-10]. 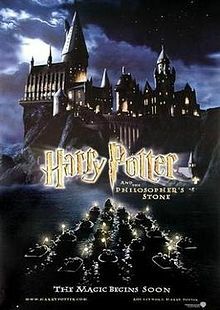 ^ 2.0 2.1 2.2 Harry Potter and the Sorcerer's Stone (2001). Box Office Mojo. [2007-05-29]. ^ Anthikad-Chhibber, Mini. Harry Comes to Hyderabad. The Hindu. [2010-02-07]. （原始内容存档于2002-11-04）. ^ Harry Potter and the Philosopher's Stone. Guardian Unlimited. 2001-11-16 [2007-05-26]. ^ Linder, Brian. Chris Columbus Talks Potter. IGN. 2000-03-30 [2007-07-08]. （原始内容存档于2008-12-06）. ^ Linder, Brian. Attention All Muggles!. IGN. 2000-05-30 [2007-07-08]. （原始内容存档于2011-08-31）. ^ 7.0 7.1 Linder, Brian. Harry Potter Casting Frenzy. IGN. 2000-06-14 [2007-07-08]. （原始内容存档于2009-04-25）. ^ 8.0 8.1 Lindner, Brian. Trouble Brewing with Potter Casting?. IGN. 2000-07-11 [2010-02-07]. ^ Daniel Radcliffe, Rupert Grint and Emma Watson Bring Harry, Ron and Hermione to Life for Warner Bros. Pictures Harry Potter and the Sorcerer's Stone. Warner Bros. 2000-08-21 [2007-05-26]. （原始内容存档于2007-04-04）. ^ 10.0 10.1 10.2 10.3 10.4 10.5 Jensen, Jeff; Fierman, Daniel. Inside Harry Potter – It May Be a Movie about a Tyro Wizard and His Magical Adventures, but Bringing Harry Potter to the Big Screen Took Real Muggle Might, No Hocus-Pocus about It. Entertainment Weekly. 2001-09-14 [2010-02-07]. ^ Koltnow, Barry. One Enchanted Night at Theater, Radcliffe Became Harry Potter. East Valley Tribune. 2007-07-08 [2007-07-15]. （原始内容存档于2007-10-11）. ^ Sussman, Paul. British Child Actor "a Splendid Harry Potter". CNN. 2000-08-23 [2010-02-07]. （原始内容存档于2014-09-26）. ^ 13.0 13.1 13.2 When Danny Met Harry. The Times. 2001-11-03. ^ Season of the Witch. Entertainment Weekly. 2001-12-14 [2010-07-18]. （原始内容存档于2001-12-20）. ^ Kulkani, Dhananjay. Emma Watson, New Teenage Sensation!!. Buzzle. 2004-06-23 [2007-08-03]. （原始内容存档于2012-06-29）. ^ Robin Williams turned down for Potter. The Guardian. 2001-11-15 [2015-08-14]. ^ Author's Favorites Cast for Harry Potter. Internet Movie Database. 2000-08-14 [2007-07-09]. ^ Young, C. Richard Harris: The Envelopes, Please. People. 2001-11-27 [2007-07-09]. （原始内容存档于2007-09-30）. ^ Morris, Clint. Interview:David Thewlis. Movie Hole. 2004-06-09 [2008-10-04]. （原始内容存档于2004-06-12）. ^ Adler, Shawn. What Would "Potter" Have Been Like with Tim Roth as Snape?. MTV. 2007-12-07 [2007-12-08]. ^ WiGBPd about Harry. Australian Financial Review. 2000-07-19 [2007-05-26]. （原始内容存档于2006-09-08）. ^ Harry Potter and the Philosopher's Stone. The Guardian. 2001-11-16 [2016-06-17]. ^ Ross, Jonathan, J. K. Rowling. Friday Night with Jonathan Ross. BBC One. 2007-07-06 [2007-07-31]. ^ Linder, Brian. No "Harry Potter" for Spielberg. IGN. 2000-02-23 [2007-07-08]. （原始内容存档于2007-11-23）. ^ Jensen, Jeff. Potter's Field. Entertainment Weekly. 2000-03-17 [2007-05-26]. ^ For Spielberg, Making a Harry Potter Movie Would Have Been No Challenge. Hollywood.com. 2001-09-05 [2007-05-26]. ^ Schmitz, Greg Dean. Harry Potter and the Sorcerer's Stone (2001). Yahoo!. [2008-08-09]. （原始内容存档于2007-12-15）. ^ Douglas, Edward. A Good Night for Harry Potter?. ComingSoon.net. 2006-07-10 [2007-10-20]. ^ Linder, Brian. Two Potential "Harry Potter" Director's Back Out. IGN. 2000-03-07 [2007-07-08]. （原始内容存档于2008-03-02）. ^ Davidson, Paul. Harry Potter Director Narrowed Down. IGN. 2000-03-15 [2007-07-08]. （原始内容存档于2008-12-06）. ^ Terry Gilliam Bitter about Potter. Wizard News. 2005-08-29 [2007-07-08]. ^ Linder, Bran. Chris Columbus to Direct Harry Potter. IGN. 2000-03-28 [2007-07-08]. （原始内容存档于2008-01-13）. ^ Harry Potter and the Sorcerer's Stone (Harry Potter and the Philosopher's Stone) (2001). Rotten Tomatoes. [2007-07-08]. ^ Harry Potter and the Sorcerer's Stone. Metacritic. [2007-07-20]. ^ Ebert, Roger. Harry Potter and the Sorcerer's Stone. Chicago Sun Times. 2001-11-16 [2007-07-08]. ^ McCarthy, Todd. Also Playing: Harry Potter and the Sorcerer's Stone. Variety. 2001-11-11 [2010-10-19]. ^ Potter Casts Spell at World Premiere. BBC News Online. 2001-11-15 [2007-09-23]. ^ "Harry Potter" Magically Shatters Records. Hollywood.com. 2001-11-18 [2007-09-21]. ^ Gray, Brandon. 'Spider-Man' Takes Box Office on the Ultimate Spin: $114.8 Million. Box Office Mojo. 2002-05-06 [2010-02-07]. ^ November 23-25, 2001 Weekend 3-day Thanksgiving Weekend. Box Office Mojo. [2013-11-24]. ^ November 30-December 2, 2001 Weekend. Box Office Mojo. [2013-11-24]. ^ Weekend Report: 'Catching Fire,' 'Frozen' Set Thanksgiving Records. boxofficemojo.com. [2013-12-02]. ^ Potter Makes Movie Chart History. Newsround. 2002-02-19 [2007-07-11]. ^ 2001 Worldwide Grosses. Box Office Mojo. [2007-05-29]. ^ Worldwide Grosses. Box Office Mojo. [2010-05-19]. ^ Harry Potter and the Deathly Hallows Part 2 (2011). Box Office Mojo. Retrieved 31 July 2011. ^ Harry Potter and the Sorcerer's Stone (2001). Box Office Mojo. [2016-05-31]. ^ BAFTA Film Nominations 2001. British Academy of Film and Television Arts. [2010-10-21]. （原始内容存档于2010-09-21）. ^ Past Saturn Awards. Academy of Science Fiction, Fantasy & Horror Films. [2010-10-21]. （原始内容存档于2011-05-12）. ^ The 2001 Saturn Awards. MovieWeb. 2002-06-13 [2010-10-21]. ^ Artios Award Winners. Casting Society of America. [2010-10-21]. ^ WINNERS FOR THE 4th ANNUAL COSTUME DESIGNERS GUILD AWARDS. Costume Designers Guild. [2010-10-21]. （原始内容存档于2011-07-08）. ^ 2001 Broadcast Film Critics Choice Award Winners and Nominations. Broadcast Film Critics Association. [2010-10-19]. （原始内容存档于2012-02-15）. ^ AFI's 100 Years of Film Scores Nominees (PDF). [2016-08-19].